I mentioned this project in passing a while ago, but since I’ve just completed the third episode, now seems like a good time to let you know a bit more about it. 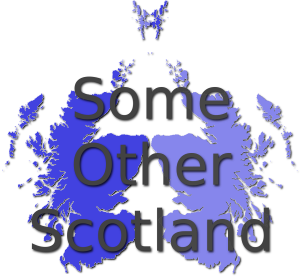 Some Other Scotland is a podcast novel. Huh? In effect, it is simply a book read in weekly episodes, not unlike a radio show. There are quite a few of these about if you look around the internet, but I like to think this one is a little different from the rest. Rather than the more rational method of writing, then editing, a book before reading it and broadcasting the podcast, Some Other Scotland is much more immediate. It is based on a week’s news in Scotland. Every day I pick out one item of news that I think could be interesting to incorporate into the bigger story, then I post a poll at the end of that week. Listeners (YOU!) can vote for the feature story. This feature will appear in some major way in the following week’s podcast, though altered in some way. This creates an alternative Scotland, full of ‘paths not taken’. For example, in the most recent episode, a mansion on a West Coast island was burnt down in the real world, but in Some Other Scotland, the fire came to nothing, stopped by a new character to the story. The first few weeks have run without much to join each story thread together, but as new items crop up in the news, changes in direction become apparent, and already I have a general plan for the larger plot. It is my intention to run this until the end of the year, unless the story draws to a natural conclusion before then. In the meantime, please visit the link above to sign up for the podcast feed, or you can stream the story from the little widget on the right hand side of this page. Your feedback would be very welcome.